I have never told you how much I respect you. kaii. I celebrate this woman. thanks for your patience and understanding. Having Ceec as a step daughter must be a tug of war. Why do you think her biological mother ran away? Her mum died, insensitive prick. CeeCee matter kill you there. She's still better than those that shoot off their baby's like a someone we know. Anon 15.58 better than does that run off babies in their wombs. I prefer to be bitter than to be a murderer. I hope those that shoot off babies too are not celebrating mother's day. 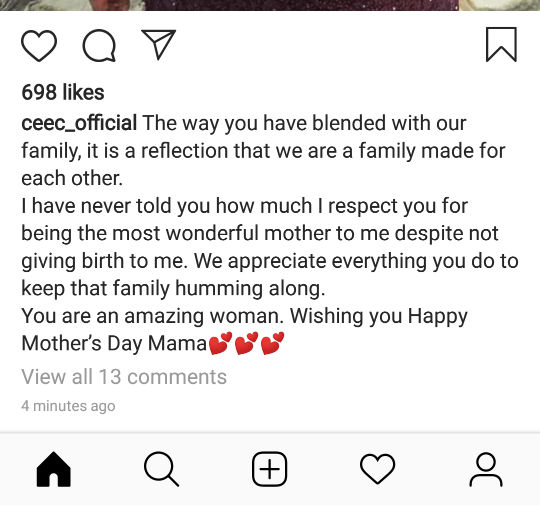 Mama I hail you for living with a person like Ceecee...you must be a strong woman.God keep blessing you. Cee C we know, who are you? Agadi nwanyi baby dragging with a girl old enough to be your grand daughter, shame no dey catch you? Who is this mgbeke backyard dietitian😕😕😕? You won't hide your jobless self nah o. She has never told her all this?never? this woman dey try, if all the kids are like this cee c woman. There's even a resemblance, wow! "...for being the most wonderful mother to me despite not giving birth to me." Very strong words. And tomorrow a woman will behave anyhow to her son's wife, thinking she is supreme because she gave birth. Lol! She is pretty. 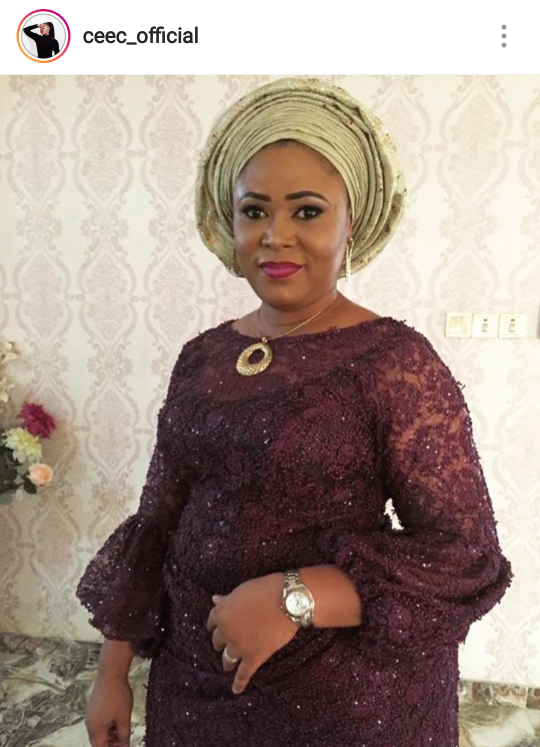 Happy mother's day Iya Cynthia. If only I can say the same for my father’s wife. To think she’s ttc . Very mean to my sisblings . Always is church praying for the fruit of the womb. God is not mocked.. Some people go just abandon the glaucoma in their eyes , but trying hard to proffer solution to person wey get cataract. If CeeC no post this msg, Una go kill am? If I dont have interest in someone, & her post comes on, I will go to the next post , since I have nothing meaningful or pleasant to contribute. Character evaluators indeed. Una dooh! Sister agbaya, bitterness detector. Cee C is better than you a thousand times. @anonymous 18:42 you are a demented fool. @miss aboki or whatever the devil calls you, you dunce, moron, Bring it on and i will tame you stray dog. Miss Aboki,Cee C's lapdog,Ku ise o!Hope you are not as bitter as your diminutive madam. Madam you deserve the best award on earth, God bless you ma. If you know, you know. Happy Mother's Day to u , mama. May u continue to live in love & fruitfulness. Actually, you cant afford to be her neighbour. I can't, because she lives in a Aso Rock Right?Where is she staying? Is she all alone on an Island?Are other people not living where she is?